After a superb first season in Australian football Scottish striker Gordon Smith has taken out the ECU Joondalup SC ‘Player of the Year’. The former Heart of Midlothian striker polled well all night and pipped Steven McGarry for the award at a packed Joondalup Lakeside Ballroom on Friday evening. McCulloch said the season showed ECU Joondalup are back, and Smith and runner up McGarry were the catalyst. “Steven and Gordon led from the front and both were outstanding during the season, along with Ryan Lowry, who finished third in the count,” he said. 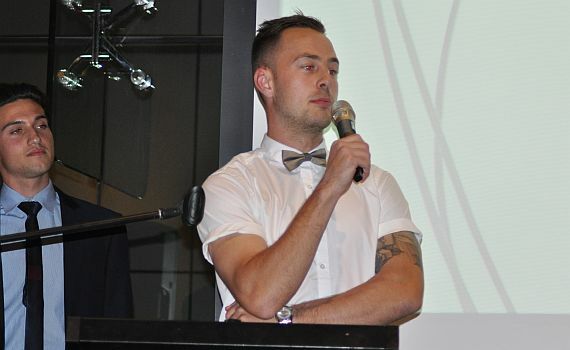 In other awards on the night Ryan Lowry won the Player’ Player of the Year, while Smith took out the Top goalscorer. Midfielder Steven McGarry was rewarded for his season by receiving an award donated by Major Sponsor Credentia Construction. In the under 20’s the player of the Year went to Stef Vranesevic, and the Players’ Player of the Year was skipper Ryan Malton, and top goalscorer was James Owen.